VANCOUVER - Vancouver is considering expanding the use of surveillance cameras when large events concentrate thousands of people together in one spot, after a municipal report into the Stanley Cup riot concluded real-time CCTV footage can help emergency officials orchestrate their response while making it easier for the police to identify suspects. The report, released Thursday along with a separate independent review of the riot, recommends the city increase the use of CCTV at large events. "The availability of closed-circuit televisions was invaluable to the response efforts during the riot in providing real-time information to all responders," says the report, prepared by city manager Penny Ballem and her staff, which will be presented to council next week. "The city and VPD (Vancouver Police Department) should bring forward to council an updated policy with regard to the future use of CCTV cameras for special events to assist with monitoring crowd activities, deployment of first responders and police, (and) identification of suspects and riot participants in the event of a significant disturbance." 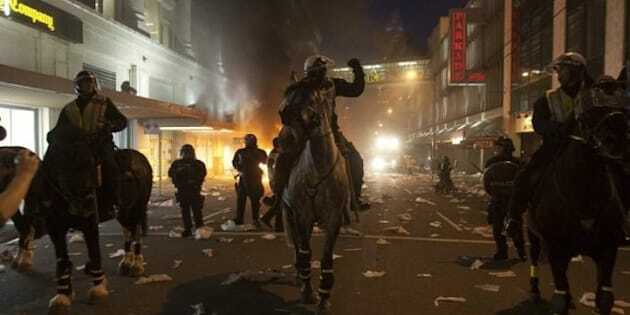 The internal report represents one of several reviews that were ordered following the June 15 riot, which saw massive crowds torch cars, smash windows and loot stores for several hours after the Canucks lost the Stanley Cup final to the Boston Bruins. An independent report into how police and the city prepared for the playoffs was also released Thursday, concluding police were quickly overwhelmed by massive crowds, which left them unable to prevent the riot once things began spiralling out of control. That report also recommended the continued use of CCTV cameras. Yet another report, an internal review by Vancouver police, will be released next week. The municipal report notes CCTV cameras were installed in the downtown core in preparation for the final round of the playoffs, after weeks of Canucks games being coupled with increasingly larger gatherings downtown. The report does not say how many cameras were installed, but their numbers grew, particularly during the final two games. Significantly larger crowds gathered downtown for Game 5, including thousands of spectators watching the game on giant outdoor screens in a city-organized celebration site. The night was also marked by a jump in liquor pour-outs. A debriefing that followed the game called for extra CCTV cameras to be installed. Similar concerns after Game 6 meant another increase in the number of cameras ahead of Game 7. Live video feeds from the cameras were available to police and the city's emergency operations centre as they co-ordinated the response during the riot, the report says. The report also says the cameras would help police identify suspects, although the extent to which police have used CCTV footage in their investigation isn't clear. Many cities already use CCTV cameras, but they remain controversial, with civil liberties advocates arguing such technology represents an invasion of privacy and leads to intrusive policing. The security plan for the last year's Winter Olympics called for hundreds of surveillance cameras to be installed temporarily on Vancouver streets, prompting the province's privacy commissioner at the time, David Loukidelis, to raise concerns the devices could become permanent. Two years earlier, similar complaints surfaced when the B.C. government announced a pilot project to put CCTV cameras in high-crime areas in Vancouver, Surrey and Kelowna, adding to cameras that were already in place. In 2000, the privacy commissioner issued a set of guidelines on the use of CCTV cameras in the province, saying they should only be used in high-crime areas when other less-intrusive policing methods aren't working. Meanwhile, the municipal report echoes concerns that alcohol was a major factor the night of the riot. The report notes many fans arrived downtown carrying alcohol or already drunk, which limited the impact of liquor store closures that were ordered throughout the core. "There is no question that too much alcohol played a role in the events of June 15," says the report. The report calls for a task force to examine how to control alcohol consumption during large events, which could include legislation that would allow officials to further restrict sales. — The creation of a special committee to manage large events, bringing together the police and other first responders, transit officials, the local health authority and the city's own emergency planning team. — Conduct thorough reviews of all sites in the city that could be used to host large public gatherings, identifying what types of events they can handle and what potential problems may arise. — Develop a system to evaluate the "demographics and mood" of crowds during events to allow emergency co-ordinators to quickly adjust their response if crowds turn ugly. — Work with local sports teams to create a "fan code of conduct" to encourage responsible behaviour.